Microsoft Excel provides a large number of Functions for processing data in Excel Worksheets easily. 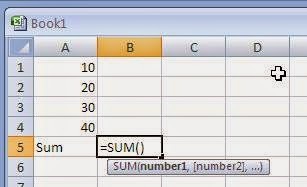 Functions are predefined formulas in Excel. 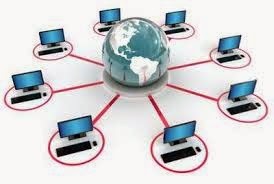 These functions are used in different types of calculations on numerical or other data quickly. 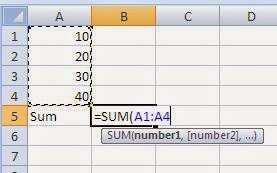 How a Function is Used in Microsoft Excel? 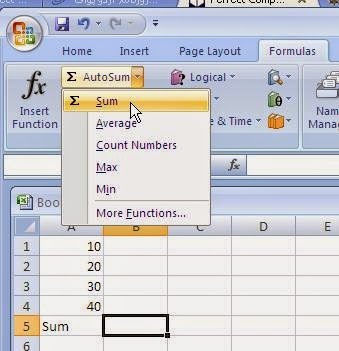 There are three popular ways to use built-in functions in Microsoft Excel. You can type a function manually in the required cell. 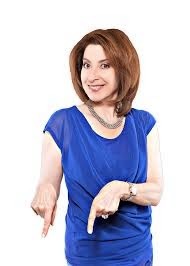 First of all press Equal key from keyboard. Then start typing function name, for example, type SUM. A formula autocomplete list box will be displayed. 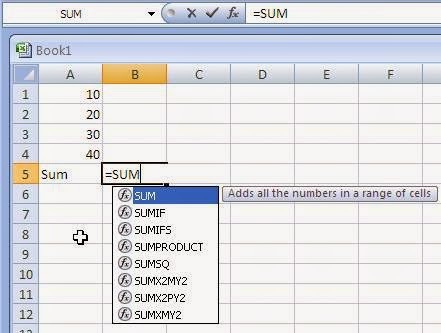 Press TAB key when SUM is selected in the autocomplete formula list box. Type cell reference of first cell, suppose A1, type a colon ( : ). 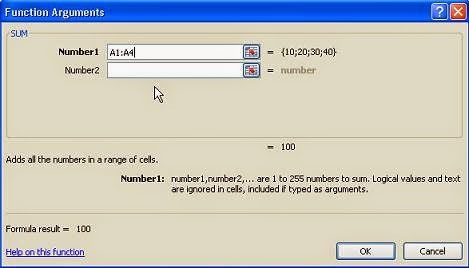 Type the cell reference of the last cell, suppose A4 as shown in the figure. Press Enter. You will see the result 100 in this cell. A function is used by its name and providing some arguments to the function. The arguments are the necessary data values for calculation. Moreover, there is an EQUAL sign before every function name. Another way to insert a function in a cell is to use the icons in the Formulas each of which is a drop-down control. 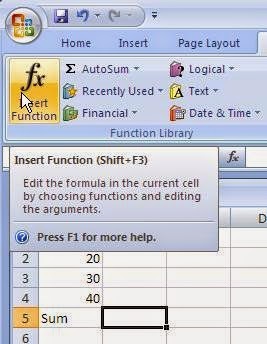 When you select a function from one of these lists, Excel displays its Function Arguments dialog box to help you enter arguments. The rest of the procedure is the same as in first method. Using the Insert Function dialog box ensures that you spell the function correctly and that it contains the proper number of arguments in the correct order. Select a suitable category of the function, for example, if you want to use SUM function then it will be found in Math & Trig category of functions. 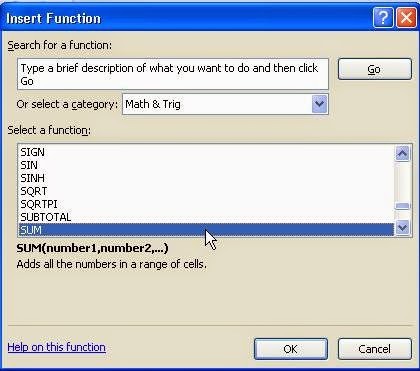 Search and select the function SUM and click on OK button. Now Function arguments dialog box will open, type suitable arguments. In Function Arguments dialog box, you can enter the cell reference of first cell and a colon ( : ) and the cell reference of the last cell to add all the numbers in the cells between these two cells including, as shown in the figure. 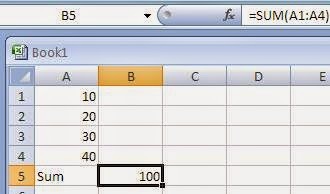 After giving argument values click on Ok button and the result 100 will be shown in the required cell.